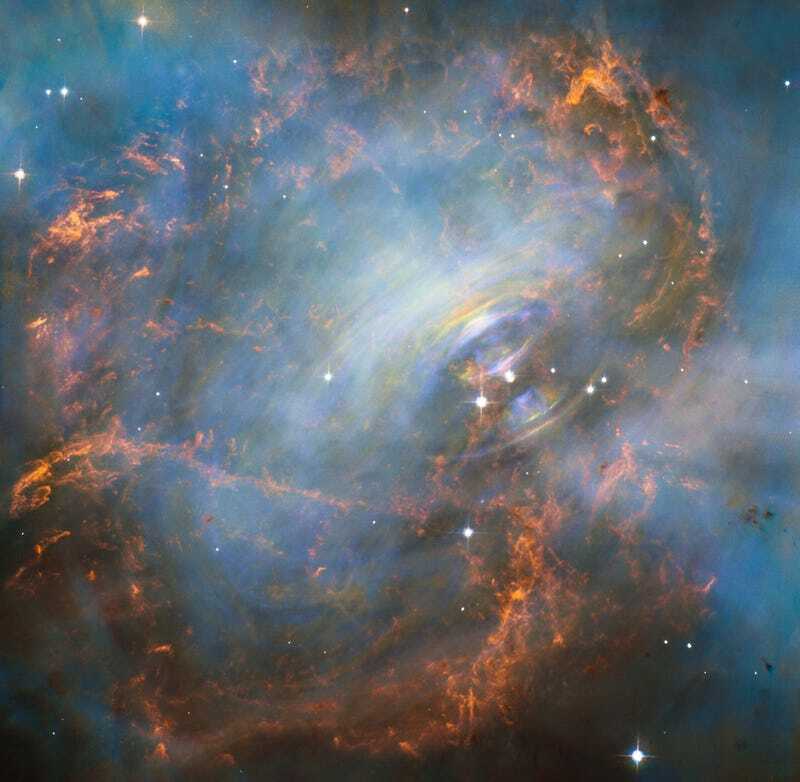 The Crab Nebula is one of the most photographed and studied objects in space. But we didn’t know what was inside until now, when astronomers got a look at the strange mess that lies beneath. Hubble grabbed this new shot of the exploded star spinning at the centre of the nebula. The star is spinning incredibly fast — 30 complete rotations every second — and generating a force so strong that the forces keeping it from simply flinging itself out into space are more than 10 billion times stronger than steel. Almost as incredible as what the researchers found is the effort it took to see past the Crab Nebula’s exterior to the inside. The final image is actually a composite of multiple images stacked on top of each other, taken over ten years. Although each image has an exposure time of just one second, the incredibly quick rotation of the star means that each shot is still something of a timelapse, which captures the spinning movement as the ripples you see. You can compare the turbulence inside with this relatively placid 3D video of the more traditional outside-in view.